Let us see, take the world’s biggest sporting event and the world’s biggest party and mash them together into a mobile slots game and you have Playtech’s Football Carnival. As long as your team wins the 2014 World Cup in Rio de Janeiro you will be happy to bring this game up on your mobile device. If things do not go well you may not wish to dredge up bad memories of football in Brazil. 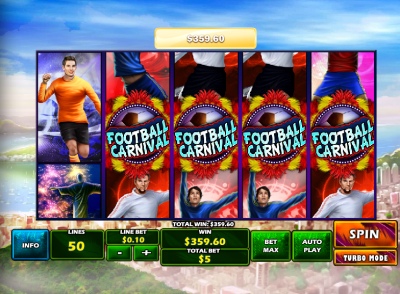 Football Carnival is a five-reel mobile slots game with 50 paylines. The games will start with a little as 0.01 coins but can bet up to 1.00 coin per line for a maximum bet of 50.00. There is no progressive jackpot available but there is a maximum in-game jackpot of 3,000X your line bet. A Max Bet option and Auto Play button are available. Football Carnival is a celebration of the 2014 World Cup. For those playing the game off in the distant future it will live on as a souvenir of the quadrennial event. The minor symbols are assumed by football players and the major symbols are reminders of Brazil: a generic stadium, the Brazilian flag, a salsa dancer, a flag-waving fan and the massive Art Deco statue of Christ the Redeemer that overlooks the city from atop Corcovado Mountain. The bold and bright colours of the graphics burst off the screen and festive music sets the mood. The Football Players may pay less but they are stacked to double size on the reels so they cover two positions on the reels. Christ the Redeemer and the Soccer Pitch are also super-sized. The Carnival Lady and the Lady Fan and the Brazilian Flag are all standard size. The Football is the Wild symbol and substitutes for all symbols save for the Scatter in helping to create winning combinations. No multiplier is attached but the Wild can create prizes on its own when it lines up on an active payline. In fact five of the Football Wilds generate the game’s top bonus of 3,000X the line bet. The Football Carnival Logo is the Scatter. Three or more anywhere on the reels will award ten free games and during all the games one Football sticks around on the middle reel as a Frozen Wild. The free games begin with a 2X multiplier and with every two spins the multiplier nudges up one more. All wins during a spin are multiplied by the multiplier’s value during that spin. The Football Carnival Logo also lights up the pay table on its own with just two paying the amount of your stake. The free games cannot be re-triggered. Now you just need your team to win the World Cup so you can really enjoy Football Carnival.